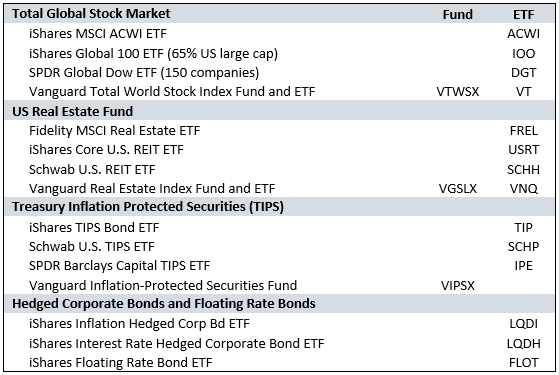 This list represents a sample of four mutual funds or ETFs that fit each Inflation Fighter Core-4 asset class. The alphabetical list includes the largest fund in each category and three appropriate funds or ETFs. All funds are low-cost and track similar indices. Some mutual funds may be purchased using a less expensive share class if certain restrictions are met. Visit each fund company’s website for details. This is not a complete list of suitable funds for each asset class and is not meant to be used as such. 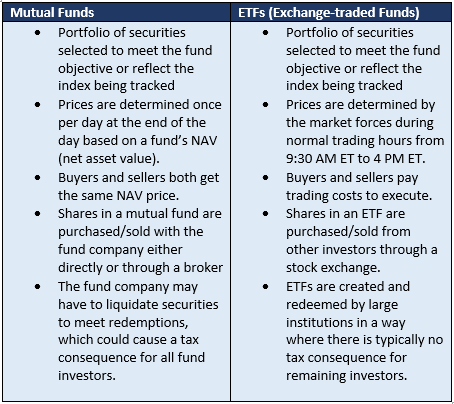 Mutual funds and ETFs are the investment vehicles of choice for Core-4 Portfolios. They are similar in structure in that they both invest in a basket of underlying securities, which in most cases concentrates on a single asset class such as stocks and bonds. There are mutual funds and ETFs covering literally every major asset class in the world including US stocks, international stocks, US and international bonds, real estate and commodities. The benefit of buying mutual funds or ETFs is that each fund offers a diversified portfolio of securities that you couldn’t otherwise efficiently create using individual securities. Copyright 2018 Core-4 | All Rights Reserved | *The information on this website is free for public use. Funding for this site is provided through advertising revenue by investment firms that provide products, custody and advice for investors. These firms also provide content for the Core-4 blog as part of the advertising agreement. You are welcome to contact any of these firms directly.